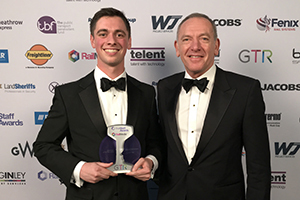 We are delighted to congratulate SELA Cohort 2014 graduate James Featherstone, who has been named Railstaff Graduate of the Year 2018. This award recognises the impact James has made in his first year with Network Rail, and in particular, his Fast Trackers outreach initiative and mentoring of current members of SELA. Fast Trackers engaged over 200 young people, inspiring them to recognise and realise their own potential, and to see careers in science and engineering as real possibilities for their future. In leading the programme, James demonstrated his continued commitment to the SELA Foundational Attributes, and especially enterprise capability and inspiration. 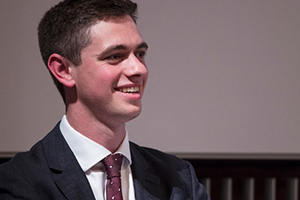 James Featherstone, graduate of SELA Cohort 2014, has been shortlisted for multiple graduate awards following his outstanding achievements and progression since embarking on the Network Rail Graduate Scheme in 2017. RailStaff Awards, and Construction News Talent Awards, have both recognised James’s ‘exceptional focus and dedication throughout the delivery of the [Fast Trackers] project’. Fast Trackers has seen James working alongside CEOs, directors, clients, teachers, students, and volunteers on a demanding project that inspires young students of science, technology, engineering and maths (STEM) subjects to continue their passion into through a career in STEM. James’s Fast Trackers team is also up for the RailStaff Awards Charitable Team of the Year, a Construction News Talent Award, and Graduate Initiative of the Year. James’s nomination for the RailStaff Graduate of the Year Award was supported by SELA, after James mentored new recruits at SELA Bootcamp 2018.